Having risen to icon status when it comes to supreme death / black metal art, BELPHEGOR are now strengthening this level with their new masterpiece, »Conjuring The Dead«. Ever since their now legendary debut »The Last Supper« in 1995, mainman Helmuth and his henchmen have relentlessly worked their way to the top with technical skills, sophisticated songwriting and truly blasphemous lyrics. After spawning »Blood Magick Necromance« in 2011, BELPHEGOR are back with their highly acclaimed fifth Nuclear Blast release: »Conjuring The Dead« - an opus that sees the band ready to conquer, possessed, on fire and stronger than ever. The ten new compositions unleash a state of brutality yet unknown to mankind. Soundscapes of a melodic monstrosity, forceful & fierce yet fulfilled with razor sharp precision. Straight in-your-face onslaughts, devastating string-slaughter, blazing machine gun drums and the sickest vo-kills, exceeding even the sickness of any other BELPHEGOR release to date! For the first time ever BELPHEGOR is reinforced by two guest musicians: Joining in for vo-kills on ‘Legions Of Destruction’ are DEICIDE’s Glen Benton and MAYHEM’S Attila. The production comes from none other than legendary studio wizard and HATE ETERNAL head honcho Erik Rutan, who gave the typical BELPHEGOR sound a menacing depth that will leave you, feeling you just been run over by a WWII battle tank! 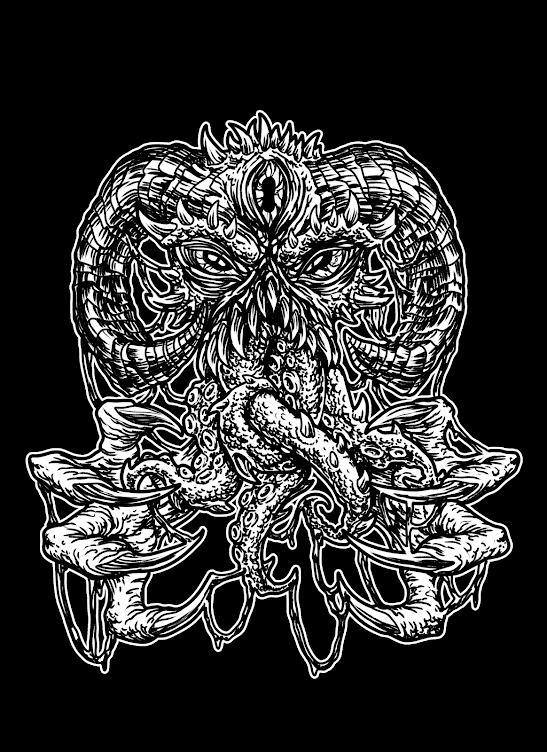 For visual duties the band gathered forces once again with Greek artist Seth Siro Anton, who also painted the cover of »Pestapokalypse IV« in 2006. I’m going to begin this review by admitting upfront that I am someone who has their fair share of eccentricities. A lot of those eccentricities in the context of musical taste involve drumming and drum production. To my ears; there isn’t anything that will tank an album for me quicker than either a bad drum production or techniques that raise my ire, like the “everything all at once two-foot blast”. It’s something I am simply incapable of ignoring and I’m completely set in my ways. I won’t say there aren’t any exceptions at all. For instance, Suffocation’s ‘Pierced from Within’ is an album I can tolerate, despite some lame, flat blasting because the material is so stellar in every other regard. The problem is, very few albums have material good enough to make me forget the irrational hatred I have of bad drum production or technique. That brings me to ‘Conjuring the Dead’, Belphegor’s tenth full length album in just over 20 years. The snare sound nearly killed this album completely for me. It’s not that it sounds like an oil drum ala Metallica’s St. Anger. It’s actually the opposite. It sounds like it came from of a $300.00 keyboard. The volume of it is frustratingly consistent, even during some of the fastest blasting on the album. That raises a red flag in my mind, since the snare diminished like normal during the same drummer’s performance on the last Belphegor album; ‘Blood Magick Necromance’. The snare’s loudness during those full-speed-ahead sections of the album is detrimental to the point of losing some excellent guitar parts (see “Black Winged Torment”) in the mix. The snare is high-pitched, dull and gated too tightly, so it doesn’t really have any impact. If you think I’m insane for spending over half of my review on the sound of a single drum; I understand. I willfully acknowledge that my hatred of something like this-for many this is a marginal detail-is completely irrational. You might be fine with it, but it’s like a dog whistle for me. Now, I’m well over half way into this review and I haven’t described the music very much, so I suppose I should do that. 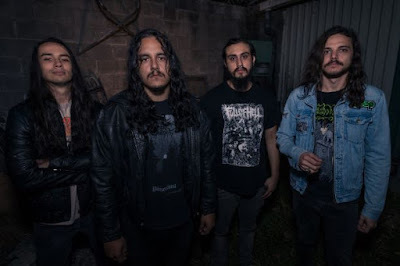 To be simplistic; it sounds like most Belphegor has since ‘Necrodemon Terrorsathan’, meaning slick blackened death metal blending elements of American-style death metal with Swedish-style black metal. You’ll hear familiar elements of Morbid Angel, Dark Funeral, Marduk, Behemoth and others, and this is certainly Belphegor’s slickest offering to date on the whole. Aside from the aforementioned snare, everything sounds great, with plenty of heft and clarity, making the snare thing all the more frustrating (again, probably for me and no one else). These days, I’m finding Belphegor’s most interesting moments to be the ones where they open things up a bit more and throw in some fresher elements or delve into more melancholy musical themes, such as with the opening moments of “Rex Tremendae Majestatis”, which feature acoustic guitar and church bells to great effect. It’s a bit more dramatic than the bulk of the album, which can seem a little dry at points. 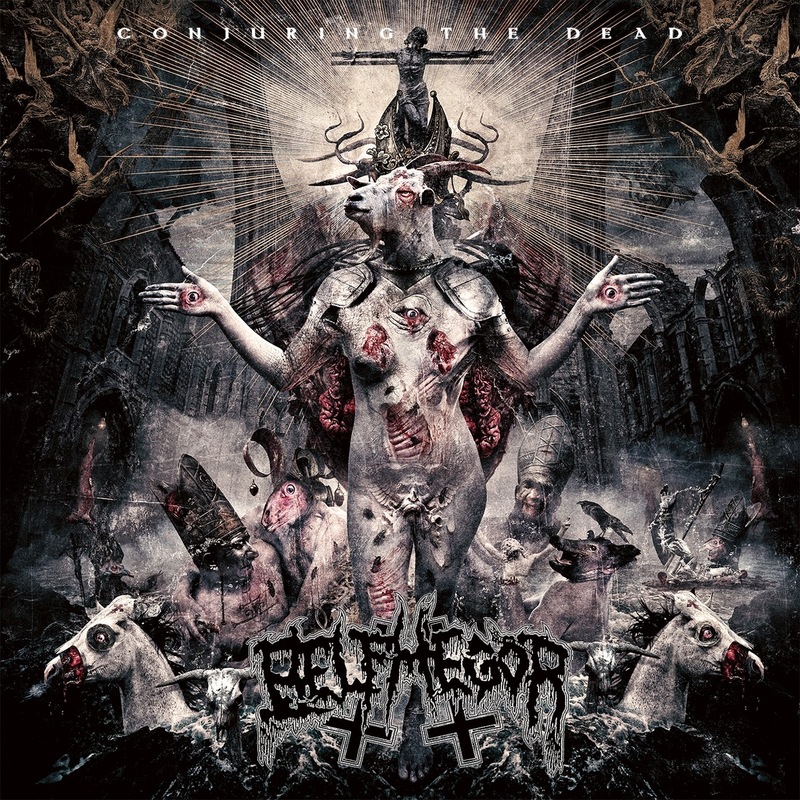 In a broader sense, I have a feeling that everyone who has enjoyed what Belphegor has done since 2000 are going to get a satisfying meal with 'Conjuring the Dead'. I definitely hear the quality and value in the album; I just can’t get beyond the snare. You’ll probably be just fine.